Here we go with tips from Dembling (2011), a psychologist who has an introverted personality and has an extroverted husband. 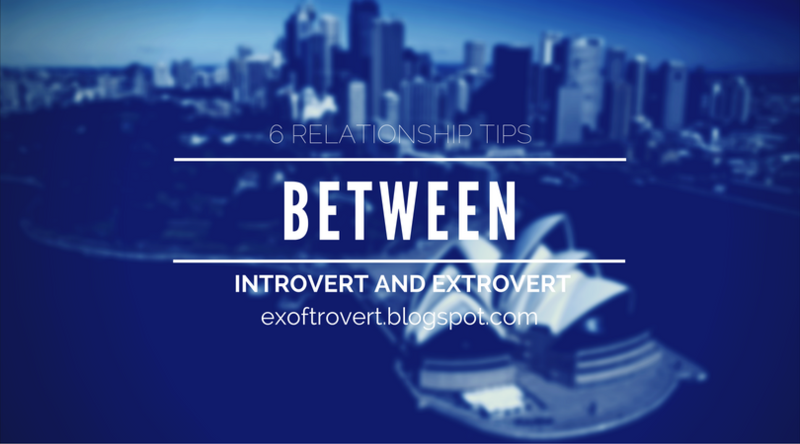 Tips for the relationship between introvert and extrovert that I summarize into six things. It is important to remember that introverts and extroverts are just the names of personality types that can be observed from their behavior and responses in everyday life. Well, these two types of personality though have a very significant difference, does not mean one is better than the other. The difference is there to be appreciated. With the difference, your relationship will never be monotonous. Your relationship will be more exciting, right? Although the impression is contradictory, precisely this difference has many advantages. Extroverts can bring their partner who is an introvert to get acquainted with new people and do more other exciting things. Meanwhile, introverts can make the atmosphere at home more peaceful with their calm. Instead of these differences being what can trigger a commotion, it would be much better if these differences were used to improve the quality of relationships. Stay comfortable even outside the comfort zone. There will be plenty of events for introverted and extroverted couples so that each will feel uncomfortable in certain situations. This can be overcome by making a deal before going to the event. Talk about "codes" between you, for example, if your partner has yawned, then it's a sign of your partner's discomfort and wants to get home soon. Introvert types usually prefer textual communication such as email and SMS, while extrovert types prefer to talk on the phone. This can be a problem if not communicated honestly. To fix this, set variations of communication with text and talk by phone alternately or at certain times. The rules of socialization between introverts and extroverts. If you like crowds and want to enjoy being with your friends, while your partner does not want to go, then you have more quality time with your friends. Likewise, if you are an introverted person and want to have time to read the book quietly, you can take advantage of your spouse's time visiting their colleagues so that the activity of reading your book is not disturbed. The key is in communication and be honest with each other's wishes. Negotiation your "me time" for each. Time for yourself is a very important thing for you who is an introverted type. Therefore, it is important to make an agreement on this matter. Communicate the need to be alone to the couple. Instead, when you're alone, you can focus 100% on your passport so that your partner's needs to be alone with you are balanced. Personality differences are not a problem if you really love your partner. In fact, this difference can be a source of strength for those of you who have different pairs of personality types. The key is in communication, mutual respect, compassion, and empathy. Hopefully, these tips from Dembling can be applied in your life.